Max Support Wattage: 300W The max wattage is 300W, suitable for any E26 E27 standard LED, halogen, incandescent and CFL (Energy Efficient) light bulbs, you can use not only low wattage bulbs but also high wattage bulbs. This adapter has CE certification, you can feel relieved to use JACKYLED 5 in 1 adapter splitter. PBT Fireproof Materials & 200 Degree Heat Resistant This 5 in 1 adapter is made from PBT fireproof materials, its anti-burning, anti-aging and the heat resistant is up to 200, no fire hazard. 360 Degree Rotating degree Each socket has 360 rotating degree design,and the bending degree is 180. You can change the angle of the socket at your will. 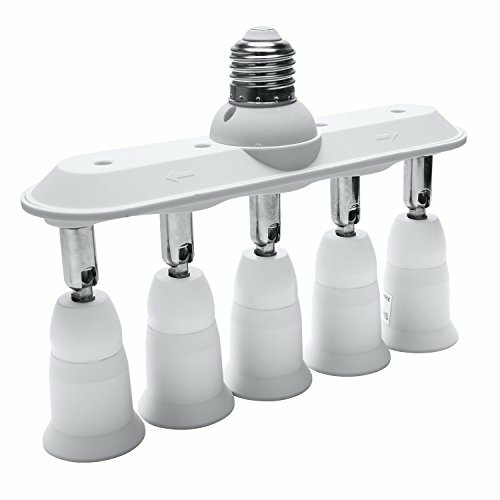 Application JACKYLED 5 in 1 adapter is standard E26 E27 base, the socket fit for any E27 bulb, can also be used for E26 bulb. This product is ideal for any occasion, if you want to upgrade your single socket light, convert a single bulb light to 3 bulbs light and improve the ambient brightness, this is the best choice for you. Perfect for the bedroom, living room, conference room, kitchen, living room, hall, telephone booths, workshops and exhibitions, etc.